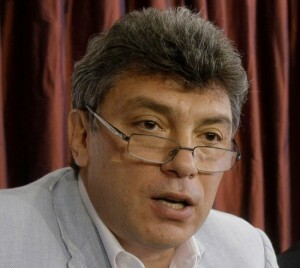 In St. Petersburg yesterday, former deputy prime minister Boris Y. Nemtsov engaged in a creative nonviolent action by himself that exposed the sorry state of Russia’s so-called democracy. They arrested him, charged him with illegal agitation, which is punishable by a fine, and confiscated his fliers. Mr. Nemtsov, whose subversive political stunts have landed him in police custody many times, called the arrest “absurd.” He said it proved the government had no intention of allowing unfettered political expression ahead of parliamentary and presidential elections this fall and next spring. Furthermore, he said, the Supreme Court has ruled that unregistered individuals have a right to publicly express opposition to all candidates.